I've been working on this gorgeous piece and was hoping that by the time I was done the sun would be out aiding and assisting me in my photography. Whilst this piece is reminiscent of a luxurious caribbean holiday with crystal clear waters in varying shades of blues and greens, my photos look more like a damp, wet day walking thru' the streets of London. Anyways.....this features an exquisite, rare,Australian chrysoprase, smooth teardrop briolette measuring approximately 30mm x 20 mm, cradled on either side by a myriad of rondells and briolettes comprising apatite,moonstone,aquamarine,deep blue kyanite and iolite. 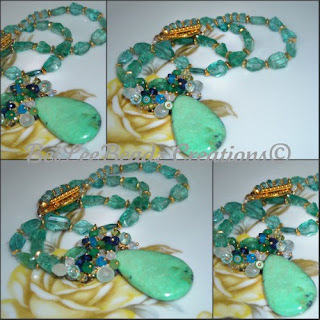 Irregular shape gorgeous blue/green apatite nuggets separated by 24k gold vermeil beads and ending with a vermeil toggle. Necklace measures approx 16.5". A fantastic buy!